July 18 PM Update: Today's 95° has pushed the seasonal average temperature up another notch to 81.2°. The expected 90s through this week will likely push it up even further to 81.6°, increasing the chances of at least tying the record. Following a record hot June, July temperatures have been not quite as hot relative to average in the Washington, DC region. 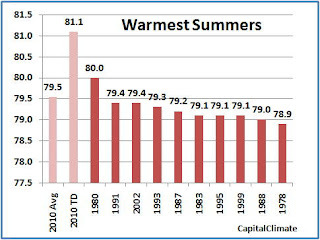 At the halfway point in meteorological summer (June-August), however, the official Washington temperature is well on its way to a place in the top 10 list of hottest summers. With a high today of 98°, the July average to date (TD) will rise unofficially to 82°, well above the long-term average for the month of 79.2°. The seasonal average to date of 81.1°, as shown on the chart to the right, would be enough to break by over 1° the summer heat record set in 1980. 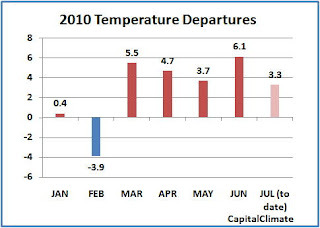 This is statistically unlikely, since temperatures for August are 1.8° below July on average. What would happen if temperatures were only average for the rest of the summer? In that case, the season would still average 79.5°, enough to displace the tied 1991 and 2002 as the second hottest summer since records began in 1871. On the other hand, temperatures are expected to reach the 90s each day for the next week, further adding to the seasonal excess. Furthermore, the monthly outlook for August, issued yesterday by the Climate Prediction Center, shows at least a 40% chance for above-average temperatures. Including today, there have now been 10 days in July with temperatures of 90° or higher. 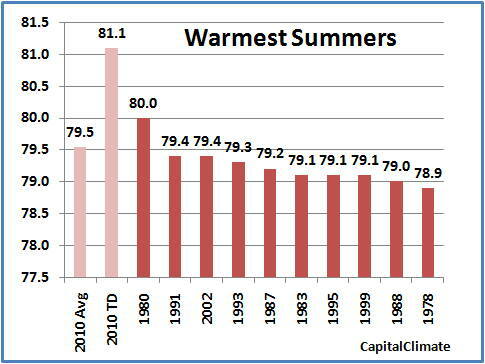 Together with the 18 days of 90°+ temperatures in June, this brings the summer total to 28, already 7 more than the final total for last year, but still 20 less than the 48 in 2002, which is currently tied as the second warmest summer. 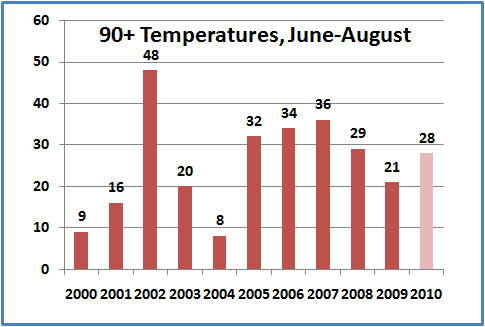 Along with the 2 days in April and 3 in May, there have been 33 days so far this year with 90°+ temperatures. 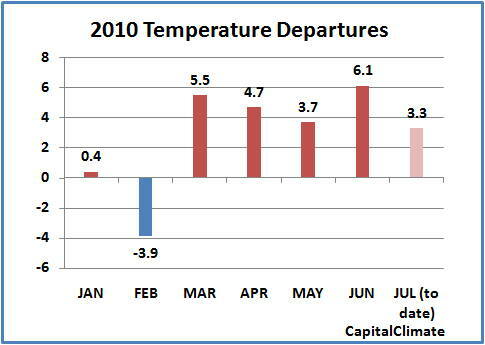 Every month this year, except February, has now been warmer than average. It was the warmest April–June (three-month period) on record for the global land and ocean temperature and the land-only temperature. The three-month period was the second warmest for the world's oceans, behind 1998. It was the warmest June and April–June on record for the Northern Hemisphere as a whole and all land areas of the Northern Hemisphere. Warmer than average temperatures were observed over large portions of nearly all continents, "with the most prominent warmth in Mexico, northern Africa, and most of Europe, Asia, South America, and the contiguous U.S." The U.S. overall was the 8th warmest on record. Cooler than average land temperatures were mainly confined to "Scandinavia, southeastern China, and the northwestern contiguous U.S. "
Ocean temperatures were warmer than average "across most of the Atlantic, Indian, and the western Pacific oceans. Meanwhile, cooler-than-average conditions were present across the eastern and equatorial Pacific Ocean, the southern oceans, and a small region in the northwestern Atlantic Ocean." Midsummer Precipitation Review: Who Ya Gonna Call? Drought Busters! July 15 Update: As expected, the new Drought Monitor report including data through Tuesday shows little change from last week. The Virginia total drought area remains at 85.9%, with the Moderate Drought portion increasing slightly to 37.4%. The Maryland total drought area declines to 85.6%, with Moderate Drought down a little to 60.5%. Just when we were getting the "d" word on the brain, the chefs down at Momma Nature's Weather Grill decided to revise the menu. The Washington-Baltimore area has been in the sweet spot for a series of showers and thunderstorms over the last several days. In fact, 5 out of the last 6 days have had measurable rain, and 2 of those had over 1", with over 2" in the 24 hours ending this morning. 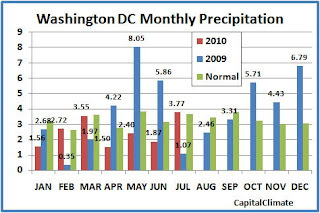 This brings the Washington July total to 3.77" so far, over 3 times the amount in last year's near-record dry July and a few percent above the normal amount for all of July. Although lawns and gardens are looking much happier in the short run, the longer-term deficit remains. Five of the 6 months so far this year have been below average. 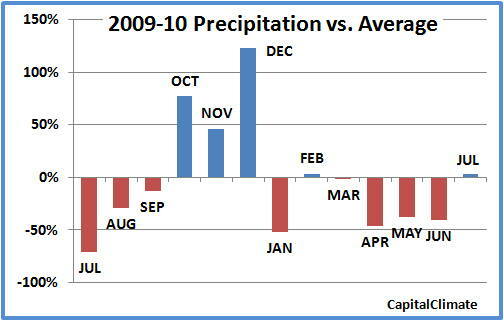 Although March was barely below, February was barely above, so the year-to-date deficit is still 3.42". Furthermore, the heaviest recent rain has been concentrated along the I-95 corridor, so some outlying areas in Maryland and Virginia are still running dry, particularly Southern Maryland, the Eastern Shore and the Northern Neck of Virginia. Even as close as Dulles Airport, the July total is less than half of the Washington National amount. This week's drought report to be issued tomorrow won't include the latest downpours, but conditions should be improved across much of the immediate area. The National Weather Service has reported that extremely heavy rainfall over the Fourth of July weekend set an all-time 24-hour rainfall record at Dodge City, Kansas, exceeding the old record from 1899 by almost 1". A band of thunderstorms developed early Sunday evening from just north of Dodge City into the St. John area. This band moved slowly south to Dodge City and produced heavy rain…especially over the northeastern part to the airport. A total of 2.62 inches of rain had fallen between 9 pm and 10 pm at the airport. That band of storms had moved out of the area shortly after 10 pm. More thunderstorms moved into Dodge City between 11 pm and midnight and produced more heavy rain. That rain ended shortly after 2 am. The last batch of rain moved in after 7 am the following morning and ended by around 930 am. In all…a total of 6.95 inches of rain had fallen at the Dodge City Regional Airport in less than 24 hours. This established a 24 hour record for precipitation for Dodge City. The previous record was 6.08 inches on June 7th and 8th way back in 1899. The monthly precipitation to date of 7.36" is now the second highest July total on record. The current record of 9.13" was set in 1962. Dodge City records began in 1875. Temperature records for San Diego extend back to 1875. The Washington weathercaster revolving door, which has been particularly active this year, took yet another spin this past weekend. Tom Sater, formerly a meteorologist on WTTG, Channel 5 (Fox), was spotted doing the 11 pm weather report on WUSA, Channel 9 (CBS), last night. The dcrtv blog reports that Sater will be doing freelance weekend substitutions during the summer for vacationing regulars on Channel 9. Since being released by Channel 5 in 2005, Sater has reportedly been a "salesman at a tractor and farm implements supply store in Warrenton." The American Meteorological Society List of Television Seal Holders [cached] shows that Thomas L. Sater is the holder of seal number 868 (inactive). Tony Pann moves from 9 to Baltimore's Channel 11. Justin Drabick appears as a weekend substitute on 4. Lynnette Charles appears as a substitute for Howard Bernstein on 9. Bob Ryan appears on 7 and Kim Martucci moves from 9 to 4. Yes, Martucci is pregnant. For previous spins of the weathercaster revolving door, see posts under the Mediarology tag.